Welcome to the first post of Termish. Please, read what this is about here, if you haven’t already. 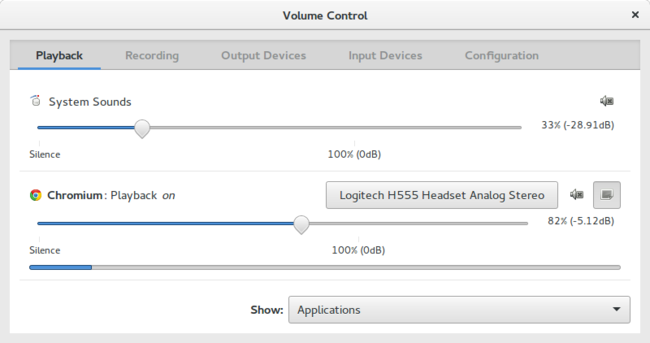 Let’s talk about PulseAudio, a popular sound server that is widely used in Linux Desktop for its features out of the box. If you don’t know which your system audio service is, probably there is PulseAudio running (considering that even Firefox use it as default on Linux from version 52). How can we control audio input/output and raise volume? There is a graphical interface, pavucontrol, which accomplish those easily. Is there a lightweight alternative to pavucontrol? Something like alsamixer to use from our beloved terminal? Well, yes; its name is ncpamixer. ncpamixer, which stands for ncurses PulseAudio Mixer, offers basic PulseAudio server control from a terminal interface; even more, there is a customizable shortcut for anything. An ncurses mixer for PulseAudio inspired by pavucontrol. If you want to give it a try, these are the installation instructions. ncpamixer is not a drop-in replacement for its GTK+ counterpart, but it’s suitable for everyday usage: it is perfect to use along with a window manager and a shortcut assigned (I personally use super+p).